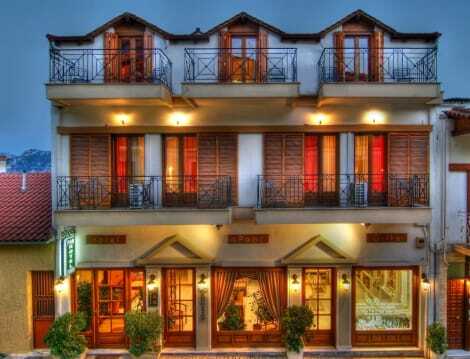 Featuring views of the Korinthian Gulf, this traditional hotel-restaurant is situated in the centre of Delphi. It offers a restaurant with fireplace and a lounge, and features air-conditioned rooms. Situated near the centre of Delphi town overlooking the amazing Corinthian Gulf, the hotel enjoys a fantastic location as it is only 300 metres from the historical part of the town and offers easy access to all the main tourist areas. Guests can reach the beach at Itea in around a 15-minute drive from the hotel and the town of Arachova is about a 10-minute drive away. The hotel is modern with traditional architecture, and is both cosy and bright. The communal areas are air-conditioned and there is also a breakfast room and a public Internet spot. Guests arriving by car may make use of the free parking spaces provided. A 24-hour check-out service is also provided, and valuables can be stored in the hotel safe. The accommodation is comfortable and bright with a quiet atmosphere. Each room comes with private bathroom with a shower, bath and a hairdryer. A double bed features as standard as does a TV, direct dial telephone, safe, mini fridge and individually regulated air conditioning and heating. Guests can stay connected thanks to the in-room Internet access provided and can relax on their room's balcony which offers a magnificent view of the Corinthian Gulf. A buffet breakfast is served in the morning at this hotel. Make yourself at home in one of the 17 air-conditioned rooms featuring flat-screen televisions. Rooms have private furnished balconies. Complimentary wireless Internet access keeps you connected, and satellite programming is available for your entertainment. Private bathrooms with bathtubs or showers feature complimentary toiletries and hair dryers. With a stay at Parnassos Delphi Hotel in Delphi, you'll be within a 10-minute walk of Sikelianos Museum and Delphi Museum. 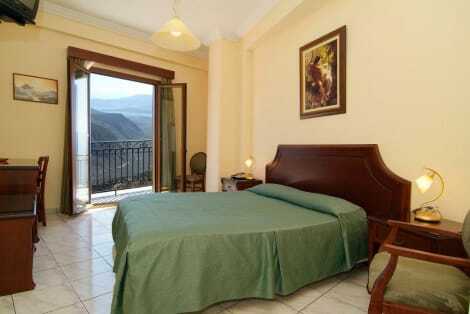 This hotel is 28.7 mi (46.2 km) from Mount Parnassus and 0.4 mi (0.7 km) from Delphi Archaeological Museum. lastminute.com has a fantastic range of hotels in Delphi, with everything from cheap hotels to luxurious five star accommodation available. We like to live up to our last minute name so remember you can book any one of our excellent Delphi hotels up until midnight and stay the same night.